Light, fresh, summer evenings call for light, fresh meals - and this is just that. This is something I chucked together for lunch last weekend, and was so pleased with the results! Best of all, it's so simple but looks and tastes amazing. No weighing or measuring here! You can keep pre-rolled puff pastry in the freezer for months, I used a roll I had left over from Christmas time. The doing couldn't be simpler - whack the puff pastry onto a baking sheet/tray on grease proof paper or the paper it comes in, and spread over a thin layer of caramelised onions. I buy them in a jar from the supermarket, they cost about a quid and are a great for keeping in the cupboard for times like this! They're also great in quiches, on homemade pizzas and with cheese. 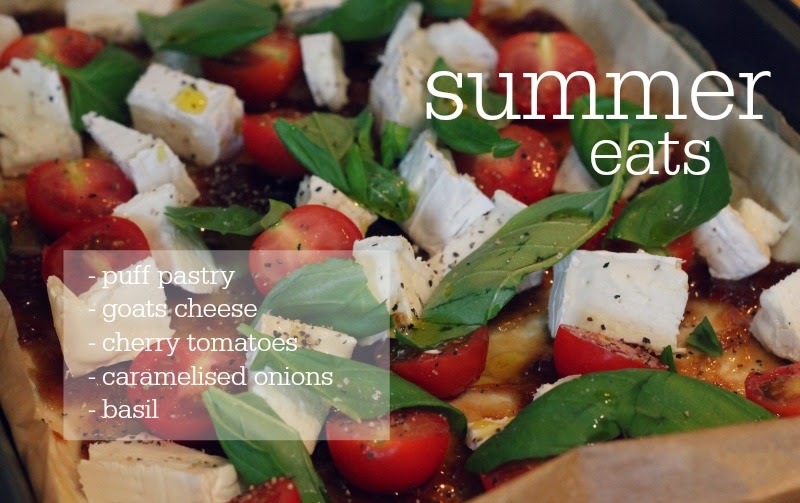 Slice up your cherry tomatoes and goats cheese and throw assemble evenly over the pastry. Tear some basil leaves and scatter over the top. Season with salt and pepper and a dash of olive oil and bake in the oven on about 160C (fan) for 20-25 minutes until the pastry is golden brown. This makes a great addition to a relaxed, picnic-style lunch and any leftovers (good luck with that!) could be used for lunch during the week. These could also be made as mini individual tarts, and feta would also work instead of goats cheese. Enjoy! This looks divine, definitely making this at some point!